Its functional characteristics make it ideal for holding semiconductors, optical, ceramics and metals with medium to large contact areas. It can be used for a broad range of applications such as holding crystals or other materials while they are being sliced, lapped or polished. It is also useful for bonding small samples in diamond wheel sawing and wire sawing operations. As with any thermal wax mounting it is extremely important to create uniform wax layer with a minimum possible thickness. The graph shown below details testing done to demonstrate the capability of thin wax line uniformity with the Mounting Wax 70 Quartz type stick wax. 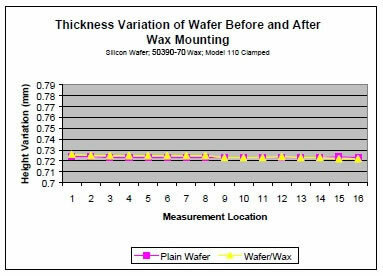 Graph 1: A silicon wafer was used as a control sample to help determine wax layer uniformity. The wafer sample, approximately 20mm x 18mm x 0.730mm in thickness was measured prior to each mounting process. Measurements were taken along 16 different points and tabulated to determine the variation in sample height prior to mounting with wax. The tabulation of these measurements are given in the graph when compared with the measure data after wax mounting. Notice how close the measurements numbers are thus signifying ideal conditions for thin uniformity. The 50390-70 wax showed thickness variation of 4 µm after wax mounting, and displayed no inconsistent thickness variation. Once heated a small amount of wax is applied to the mounting block surface and allowed to melt completely. This wax is characterized with a low melting point of approximately 70° Celsius. Although this is the listed melting point, the actual flow point of the mounting wax appears to be slightly above this threshold and was found to be closer to 80° Celsius. Place the sample onto the mounting block and immerse into the wax. Excessive wax can lead to poor results and therefore should be avoided. The sample and mounting block are then clamped together using some type of clamping device, typically a spring-loaded clamp such as the Model 110 Sample Mounting Fixture. The entire clamped assembly is then placed onto a heat sink and the sample/sample mounting block assembly is allowed to cool to room temperature. Place the specimen and mounting block onto a heated hot plate. Heat is adjusted to a particular temperature dependent upon the melting point of the adhesive wax. Allow the in place wax to melt completely. Gently remove the sample with tweezers. Allow sample to cool until room temperature is reached. Place the sample into warm soapy water and allow wax to soft and remove. Wax Removal can be increase by ultrasonication in warm soapy water. Remember wax mounting of samples can have a profound effect on the final outcome of lapped and polished samples. Depending upon the critical nature of the sample and how precise the sample thickness must be, will dictate how careful a user must be when mounting samples prior to processing. The proper selection of mounting wax, hot plate temperature, and clamping techniques will help ensure that a uniform, consistent wax layer is obtained. Measuring the sample thickness following wax mounting is key to understanding how well the sample has been mounted and to eliminate possible errors in lapping. Mounting Wax 70 is available online from the EMS Catalog. For ordering or product information, click here.